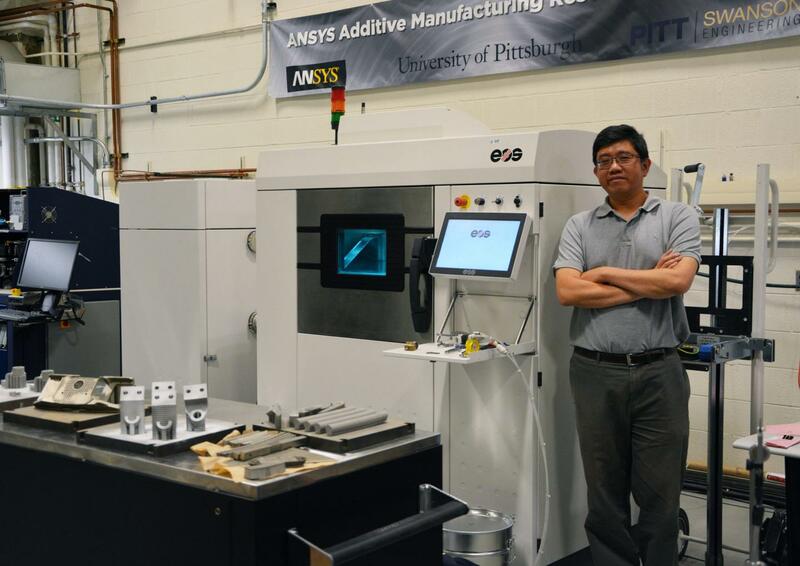 PITTSBURGH (July 6, 2018) … Additive manufacturing (AM), or 3D printing, is an advanced manufacturing process capable of fabricating complex components by sintering layers of powders together. This process requires support structures to maintain the component's structural integrity during printing. Unfortunately, removing these supports is not only expensive, but can also be difficult-to-impossible if the supports are located in the interior of the component. This limits the adoption of AM by industries such as nuclear energy, which rely on cost-effective manufacturing of complex components. To find an effective solution to these complex processes, the University of Pittsburgh's Swanson School of Engineering will be the lead investigator on a $1 million award to advance design and manufacture of nuclear plant components via AM. The award is part of the U.S. Department of Energy (DOE) Office of Nuclear Energy's Nuclear Energy Enabling Technologies (NEET) program. The novel research will be directed by Albert To, associate professor of mechanical engineering and materials science (MEMS) at the Swanson School. Co-investigators include Wei Xiong, assistant professor of MEMS at Pitt, and Owen Hildreth, assistant professor of mechanical engineering at the Colorado School of Mines. Corporate collaborators in Pittsburgh include Curtiss-Wright Corporation and Jason Goldsmith at Kennametal Inc. The integrated approach taken by the project team will be to develop innovative dissolvable supports, greater topology optimization, and improved microstructure design to make state-of-the-art nuclear components at lower cost, with minimal distortion, and greater structural integrity. "Many gaps still remain in the scientific understanding of additive manufacturing, most especially the optimization of the assembly process while reducing build failure and cost," Drs. To and Xiong explained. "Removing internal support structures in complex additive manufactured components via post-machining is costly and sometimes impossible. By integrating dissolvable supports, topology optimization, microstructure design, we have an opportunity to drastically reduce post-processing costs for AM components, while ensuring manufacturability of designs with complex internal features like those needed in the nuclear industry." According to Dr. Hildreth, post-processing accounts for 30 to 70 percent of the cost of producing AM products, with support removal accounting for the majority of those costs. "Our dissolvable support technology enables consolidation of the many manufacturing steps currently required for complex nuclear components into one AM assembly. This will reduce manufacturing costs by 20 percent and improve manufacturing schedules by at least six months," he explained. "This work will help bring dissolvable supports to not just nuclear applications, but to the broader metal AM community so that costs can be significantly reduced. Metal AM is projected to be a $21.2 billion industry in five years, and these batch-processable dissolvable supports could save the industry $10 billion while also expanding design freedom and reducing post-processing machining." The Pitt Award is one of five NEET Crosscutting Technologies projects led by Department of Energy national laboratories, industry and U.S. universities to conduct research to address crosscutting nuclear energy challenges that will help to develop advanced sensors and instrumentation, advanced manufacturing methods, and materials for multiple nuclear reactor plant and fuel applications. This is the Swanson School's second NEET award in as many years. In 2017, Kevin Chen, the Paul E. Lego Professor of Electrical and Computer Engineering at Pitt, received $1.275 million to lead a collaborative study with MIT, the National Energy Technology Laboratory and Westinghouse Electric Corporation to develop radiation-hard, multi-functional, distributed fiber sensors, and sensor-fused components that can be placed in a nuclear reactor core to improve safety and efficiency.